Big Agnes Fairview 2 Tent with Footprint and rain shield (dog not included). Condition is Used. Shipped with USPS First Class Package. 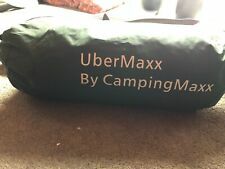 UberMaxx 2 Person Tent. Condition is Used. Shipped with USPS Parcel Select Ground. The tent weighs only 3.4lbs which allows for easy transportation with an included carrying bag. EASY SETUP: No assembly required, the automatic pop-up design allows you to set up and fold down the tent in a matter of seconds. Very useful in places where you cannot find a restroom or if you are camping in a remote area. Fishing Tent - A very convenient tent for all those fishing entusiasts. You no longer have to sit in the sun or hold an umbrella when you go fishing. If you are looking for longer stay camp tent check out AMAZON NTK or buy a tarp to set up your camp under. Nano-Flex technology, pure white fiber glass poles interconnected with high performance elastic strings. If you are looking for longer stay and wet camp tent check out OREGON NTK or buy a tarp/canopy to set up your Panda under it. Self repairable system Retract zipper technology. GREAT DESIGN design for super easy quick setup with continuous pole sleeves system. Since the footprint is included, feel free to pitch the "fast fly" option- by using only the fly, poles and footprint you'll have a lightweight sun shelter. Fully taped floor seams, combined with the bathtub floor construction will ensure you stay dry and happy while you camp. It is not fire-proof. The 6 person outdoor camping tent is perfect for the beginner campers. Great for backyard or camping setup. 6 Person Camping Tent. The large storage locker and built in storage pockets are great for stowing extra gear. Set up and tear down in seconds. Durable seams, sturdy zippers, and water resistant PU coated polyester. External tent: 190T terylene. Bottom tent fabric: high quality waterproof PE. 8 Person Large Family Tent . 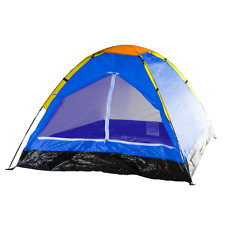 Perfect for your family of 8, this extra-large tent doesn't just have space just to sleep. "Pricing is excellent for this quality and size of tent, it is easily setup and provided excellent. Not only is it affordable, but it competes in weight as well.This 2-person tent features 30.5 sq ft of interior usable space, accommodating 2 adults. Three season, two pole free standing tent. Tent fly ventilation windows. 3 windows for ventilation within the cabana & gives visibility to see in and out of the tent. It is the fastest and easiest set up and take down! It provides protection from the sun, rain and wind. Shelter is seconds away with the WolfWise Pop-Up Shower Tent. Set up in as little as 10 seconds, popping it open without tent poles. Pop-up Tent 1. Repairing will normally takes 1-2 months. New Arrival. Is this easy to set up?. Will this keep you dry?. Great for camping & backyardÂ. Roll back rainfly and guy outs for added ventilation. Power Port for electrical cord access. We will work with you to resolve any problem you may have. Functions as intended. Does not appear to have been used. (1) Tent poles (1) Person Tent. • (1) Person Tent. • (1) Tent poles. We personally understand the importance of saving money while getting a quality product. H20 Block Technology combines water repellent fabrics with active bead technology for faster water runoff paired with sealed seams and rain-resistant door/window seals. Includes rain fly, tent stakes, and carry bag. Functional but, A tent pole is split. Moderate wear. A tent Pole is broken. (1) 8-Person Tent (1) tent pole. A tent Pole is broken. • (1) 8-Person Tent. Keep this in mind when buying an item as a gift or if you are a collector. Light Weight 2 Person Two-Pole Aluminum Freestanding Tent Waterproof Coated NEW. Two-season, two-pole freestanding tent. Tent fly ventilation windows. You'll get premium coverage while sleeping under the stars with its best-in-class waterproof coatings on the floor and fly. You can also use it as a model changing room during photoshoots, or a temporary dressing room. UPGRADED MATERIAL AND DESIGN: Constructed out of premium 190T polyester with silver coating for long lasting performance. Outer Tent: 170T polyester fabric. Inner Tent: 170T polyester fabric. Tent pole: 8.5mm carbon fiber. 1 Automatic Tent. 4 Tent Peg. Total weight: Approx.3kg / 6.61lb. Unfolded size: 200 200 140cm / 6.56 6.56 4.59ft. Great tent for family camping. Removable center room divider for privacy or one large 115 square foot room. The two front doors provide separate exit/entry from either room. Sets up in minutes with two people. NEVER GET WET - Large 10.5' x 10' coverage will keep you protected from anything mother nature can attack you with. Water-proof Camping Shelter. Color-Desert Storm Camo. BETTER QUALITY, HALF THE PRICE - Why spend extra money on an overpriced rain fly?. Model: Beach Tent. 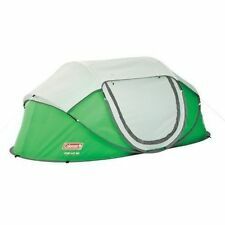 1x Tent With Carrying Bag. Ground Nail QTY Fold Size Extend Size Outer Material 190T Silver Coated Polyester Cloth. 2-3 Person. High Standard Steel. 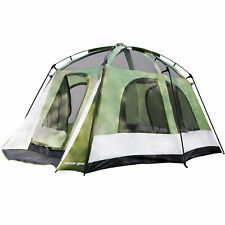 This 2 person and 2 seasons tent is ideal for dry weather use, backyard camping, rock concerts etc. It is a budget tent that will surprise you. Available in two color combinations: Navy Blue and Hunter Green. · More Breathable. · Ultralight & Portable. · Great for camping, hiking traveling and other outdoor activities. Capacity: 2-3 Person. We will try our best to reduce the risk of the custom duties. 1.MULTI-PURPOSE AND ROMMY: With the flysheet and inner together, you will get a professional double layer camping tent, which is warm and waterproof. Because of the removable inner that allows you use the inner alone as a canopy under the sunshine. Weight : Approx 1.81kg (Not included tent peg wind rope mat). 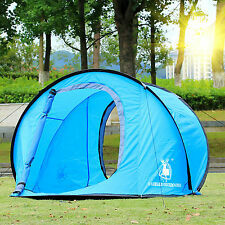 Tent Size: (210 65 65)x125x100cm. Tent Fly Material: 20D plaid cloth. 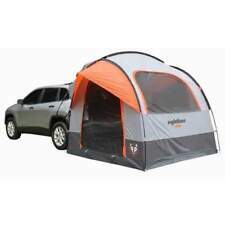 Capacity:2 Person Tent. Tent Bottom Material: 20D oxford cloth. Inner Tent Material: B3 breathable nylon net. · More Breathable. · Ultralight & Portable. · Great for camping, hiking traveling and other outdoor activities. Rain Fly: 210T top polyester, W/R PU 2000. · Waterproof. Bottom part made from 210D oxford with 2000 mm waterproof PU coating. STRONG STRUCTURE: With elastic flat steel structure and sandbag on both sides, our tent is firmly even in the case of gale. 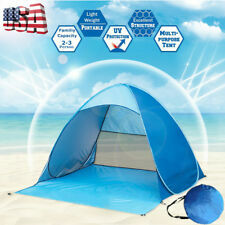 Pop Up Portable Beach Canopy Sun UV Shade Shelter Camping Outdoor Fishing Tent. Tent "Skif 2" camouflage. Tent "Skif 2" khaki. Outer tent:Polyester 75D/190T PU 3000 mm. Due to this, the tent is well ventilated. Stand:Steel Ø16 mm. Classic single house. Total weight:2,13 kg. Having difficulties with the choice of clothing size?Write to us. NEVER GET WET - Large 10.5' x 10' coverage will keep you protected from anything mother nature can attack you with. MOST TRUSTED BY OUTDOOR PROFESSIONALS - Engineered by experienced outdoorsman, Lone Wolf Outdoor Technology thought of every possible way to make this product a survival tool essential.